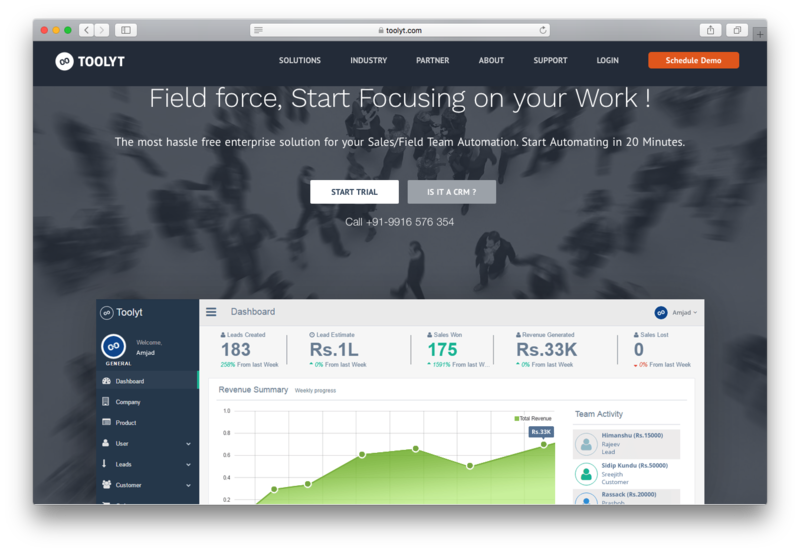 "Toolyt is a field force productivity tool, to make your field officers (sales team, data collection team, delivery boy, service guys) etc. productive by 40%." Toolyt scored 72/100 in the Field Service Management (FSM) category. This is based on user satisfaction (83/100), press buzz (26/100), recent user trends (falling), and other relevant information on Toolyt gathered from around the web. Toolyt is a web-based enterprise solution designed for field team automation. It is a field service management platform that automates sales/field team processes while fully integrated with in-house salesforce requirements. The software solution serves as a smart assistant specifically tailored for field agents and field service providers to help increase productivity and efficiency. Toolyt facilitates the field service process by utilizing custom and event-driven workflows, allowing managers and supervisors to effectively track sales and field operations. As a sales and field service automation solution, Toolyt aims to help accelerate and simplify the way sales teams and field service officials perform tasks while out on the field. Toolyt helps to automate a wide range of tasks, including account management, ranking prospects, taking notes, logging calls, documenting observations, and so on. By automating some of the repetitive and time-intensive tasks, sales teams, field agents, and reps are able to save time and effort so they can focus on the more important aspects of the business. This versatile and powerful field service management solution is easy to use and highly accessible to novice and non-tech savvy users. Work order management – Toolyt offers a work order management solution, which automates workflows and helps users assign the right people to the right project based on expertise, location, and team availability. Team collaboration – The web-based platform promotes team collaboration by providing teams and managers a more stable way of communicating, which helps save time by eliminating over-reliance on email and messaging platforms. In-depth analytics – Toolyt provides custom-built salesforce analysis through a smart and accurate analytics tool. It is capable of providing real-time data and fairly precise forecasting. Real-time reporting – Managers and supervisors receive a wide array of reports including real-time reporting of field staff performance, project status, and sales information. Service management – Field agents and sales teams are able to use any device whenever they’re in the field or not. Even on the go, select personnel can still access a wide range of data including project information and customer data. Other features available with Toolyt include data collection and survey, visits management, task management, performance tracking, and sales force automation. Toolyt is ideal for small and medium-sized businesses that want to improve the performance and productivity of field-based employees. The web-based software solution automates all crucial but repetitive and time-consuming tasks, enabling field reps and agents to be more effective in doing their jobs and achieving objectives. The platform also allows managers to keep track of agents on the field, monitor their progress in real time, and provide them with customer information to become more productive while on the field. It also gives field supervisors and decision makers fully integrated Salesforce analytics tools, which allows them to build accurate forecasts and reports based on real-time information. Toolyt provides users the ability to streamline and delegate jobs to the most qualified employees based on skills, knowledge, location, criteria, and availability. Team collaboration is also made more efficient and effortless with the right communication tools. The software solution does away with traditional email and phone call communication. It instead utilizes one-to-one communication between the manager and the teams on the field. Using Toolyt, teams are able to access customer information, job assignments, and other critical data using their mobile device, allowing them to approach any job assignment as efficiently as possible. The platform helps SMBs and organizations transition smoothly from a conventional setup into a paperless, fully automated sales force and field management service. A paperless setup means field officers won’t have to print out documents every time they provide any kind of service or accomplish a job. All transactions are stored and protected via the cloud—files, notes, or receipts, all of which are digitally entered into the Toolyt app and kept on the cloud. This feature benefits businesses of all sizes or scales as it can help expedite many time-consuming tasks and processes, as well as cut down expenses on paper and printing devices. Toolyt offers in-depth analysis of field activities, well-organized reporting and analytics, smart biometric check-in without internet, expense and claim tracking tools, as well as customization and personalization capabilities. The Toolyt field service management solution is available to SMBs with a simple and competitive enterprise pricing structure. Plans come with a variety of features and services. For more information about Toolyt’s enterprise pricing and the features available, interested parties may visit their official website and contact their sales team directly. You may also ask for a quote and request a demo of the web-based field service management software solution. Small and medium-sized businesses that may have a highly skilled and very effective field team, but still find their output less than optimal, could benefit from software solutions like Toolyt. The web-based field service management platform provides the tools and the applications that allow your organization to be more efficient and productive when it comes to managing field-based employees. Toolyt can help boost your organization’s sale success rate, increase the productivity of your field teams, and improve customer satisfaction. The platform offers a variety of automation solutions, including expense claim automation, supply chain automation, sales force automation, HR process automation, store auditing automation, and more. Product recommendations, vendor rankings, market overview and tips on how to select Field Service Management (FSM) software for business. Published in April 2019. Does Toolyt offer guides, tutorials and or customer support? Does Toolyt integrate with any other apps? What platforms does Toolyt support? What is Toolyt generally used for? Does Toolyt offer multi-user capability (e.g. teams)? Does Toolyt offer an API? Who are the main user groups of Toolyt?